Glasgow's reputation as 'The Friendly City' is reflected in a wide range of arts festivals covering all of the art forms, and in an extensive programme of cultural and sporting events. The arts festival programme runs throughout the year starting with Celtic Connections' in January which is attended by over 100,000 people. 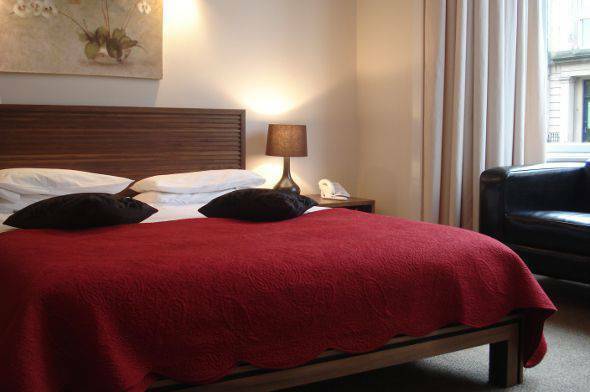 Other music festivals include Glasgow International Jazz Festival, Big World Music Festival and Triptych. Some other major international festivals include Glasgow International Festival of Contemporary Art and the New Territories Dance Festival. Summer events include the West End Festival, Shakespeare in the Botanic Gardens, the World Pipe Band Championships and the Great Scottish Run. Since its beginnings in 1993, this festival has become a premier showcase for music and culture, featuring artists from the Celtic heartlands of Canada, USA, France and Spain - as well as Scotland. In 2006, Celtic Connections takes place between 11th and 29th January. Annual festival of contemporary dance and live art presented by New Moves International. Tramway and other venues. The inaugural year of this festival which aims to showcase Contemporary Visual Art in public venues and artist-run spaces throughout the city. 2005 featured work by Steven Campbell, Jake and Dinos Chapman, Douglas Gordon and Barabara Kruger. Music Festival embracing genres as diverse as Indie, Jazz, Neo-Classical, Reggae and Dance. Annual festival of Americana music which showcases emerging talent alongside established names. 2005 featured artists such as Steve Forbert, Eliza Gilkyson, The Resentments, Jimmy Webb, Jesse Dayton and Vic Chestnutt. Free day of music, dance and family entertainment which is centred on Glasgow Green and usually takes place during the first weekend in May. Includes the traditional May Day Rally and Parade. Having started off as a small local festival centred around Byres Road, this has now grown over the past 9 years to become the biggest cultural event in Glasgow's calendar. The very popular street party is on 12th June and features stages, stalls, buskers and food. This year's parade on the 18th June celebrated the 400th anniversary of the creation of the Trades House of Glasgow and the theme was the life and times of the year 1605. Now in its 5th year and based in Sighthill, this festival was set up to promote integration and harmony by celebrating cultural diversity within the local community. A family-orientated day, usually at the beginning of June, with a children's tent and stage, sports arena and children's rides as well as music, dance and food from all around the world. This year's highlights included performances by Dionne Warwick, Georgie Fame, Courtney Pine and Kyle Eastwood. Feast of popular classical music at the Royal Concert Hall in Glasgow. This year's concerts feature music from the movies and musicals, Dvorak and Tchaikoksky. Not forgetting the last night of the Proms, featuring violinist Nicola Benedetti. 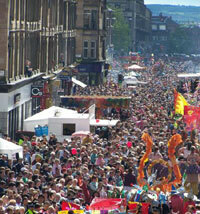 The Mela (meaning 'gathering' in Sanskrit) is organised by the Scottish Academy of Asian Arts and is the highest profile multicultural music and dance festival in the West of Scotland. This event has been held in Glasgow since 1986 and in 2004 attracted over 8,000 musicians from all over the world. Each year Glasgow plays host to one of the largest road races in the UK - participants can choose between the half marathon or 10k. The race will take runners past some of the city's most famous attractions and will again feature the hugely popular run over the Kingston Bridge, before finishing in Glasgow Green. Run Glasgow Web site has information about where the race takes place and how to enter. A unique chance for the public to visit some of Glasgow's most interesting buildings over one weekend in September. Organised by Glasgow Building Preservation Trust. The Merchant City Festival presents a programme of film, theatre, comedy, visual arts, street theatre, live music, food and fashion - all taking place amidst the architectural elegance of the Merchant City. 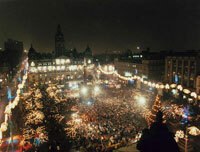 Glasgow's annual festival of World Music. Last year's line up included Miriam Makeba, Angelique Kidjo, Mory Kante, Louis Mhlanga and Musafir. Scotlands annual celebration of queer culture with events spanning comedy, film, visual art, performance and community arts projects. This annual festival of the arts for children and young people is now in its 8th year. Family days, performances, workshops, events and activities for pre-5s and schoolchildren as well as a special Youthfest programme for young people aged 16-20. For more information contact Maggie Singleton, Arts Development Officer, Children and Young People. This annual fireworks spectacular on Glasgow Green in early November, with funfairs and family activities, marks the beginning of the festive season. Skate or spectate at the outdoor ice rink in George Square from late November until Christmas Eve. The world's friendliest Hogmanay party takes place in George Square and features top bands, DJs and fireworks.